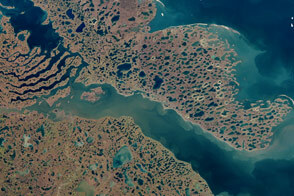 Omulyakhskaya and Khromskaya Bays lie along the northern Siberian coast, southeast of the Lyakhov Islands. The northerly location almost guarantees ice in the adjacent East Siberian Sea, and permafrost blankets the land around the bays. 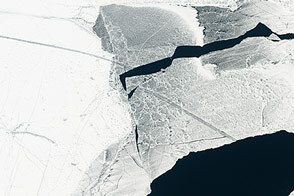 The Thematic Mapper on the Landsat 5 satellite captured this natural-color image on June 15, 2009, when ice lingered on the sea surface and on some inland water bodies. The land around the bays is dotted with thermokarst lakes, which result from water released by thawing permafrost. Lacking drainage, the melt water accumulates, forming small lakes. Although far too cold for a pleasant dip, the water in these lakes is generally warm compared to the surrounding frozen ground. Because the beds of thermokarst lakes rarely freeze, they warm the ground underneath, generally keeping it from freezing. Known as talik, this unfrozen ground is softer than the surrounding permafrost. As water wears away at this relatively soft ground, the lake can deepen and expand over time. The water in a thermokarst lake doesn’t always stay put; these lakes can melt through the surrounding permafrost and drain into a nearby water body, especially if it sits at a slightly lower elevation. This appears to have occurred in multiple lakes between the bays shown above. (The compound lakes are identifiable by their uneven margins.) Coastal erosion and river migration also can deplete the lakes. Dark brown spots, especially numerous east of Khromskaya Bay, are probably locations of former thermokarst lakes. 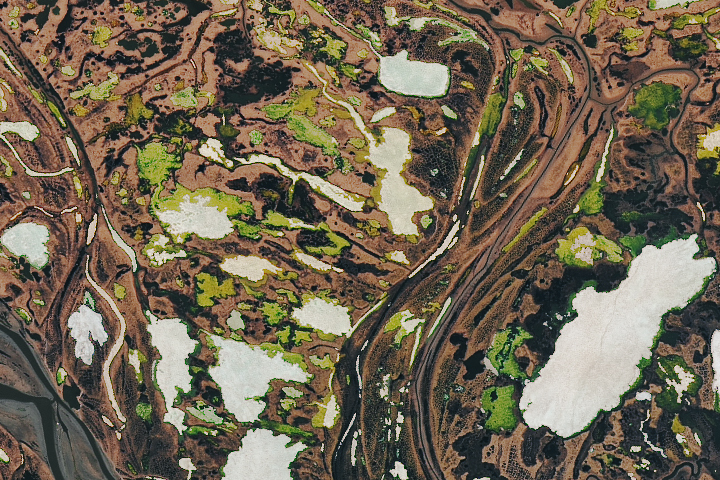 Because thawing permafrost and thermokarst lakes release carbon and methane—both greenhouse gases—scientists monitor these landscapes closely because of their implications for future climate. 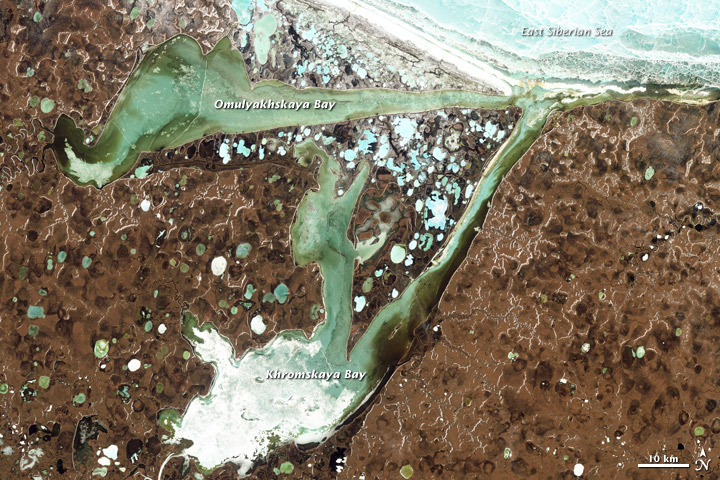 Acquired June 15, 2009, this natural-color image shows Omulyakhskaya and Khromskaya Bays along the coast of Northern Siberia. Arctic Sea Ice News and Analysis. (2009, July 6). Melt season in high gear. National Snow and Ice Data Center. Accessed August 12, 2011. De Schutter, P. (2005, May 3). Thermokarst. Open University Geological Society Mainland Europe. Accessed August 12, 2011. Brown, J., Ferrians, O.J. Jr., Heginbottom, J.A. , Melnikov, E.S. (2001). Circum-Arctic map of permafrost and ground-ice conditions. National Snow and Ice Data Center. Kienast, F., Schirrmeister, L., Siegert, C., Tarasov, P. (2005). Palaeobotanical evidence for warm summers in the East Siberian Arctic during the last cold stage. Quaternary Research, 63(3), 283–300. Kirpotin, S., Polishchuk, Yu., Zakharova, E., Shirokova, L., Pokrovsky, O., Kolmakova, M., Dupre, B. (2008). One of the possible mechanisms of thermokarst lakes drainage in WestÃ¢â¬ÂSiberian North. International Journal of Environmental Studies. 65(5), 631–635. Lansdat Program. (2011, February 11). 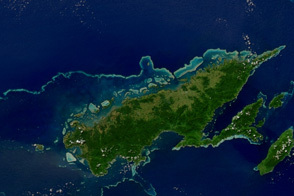 Khromskaya and Omulyakhskaya Bays. NASA Goddard Space Flight Center. Accessed August 12, 2011. National Snow and Ice Data Center. All About Frozen Ground. Accessed August 12, 2011. Permafrost Laboratory. 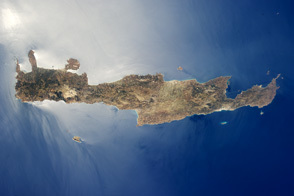 (2011). Thermokarst Lake Drainage – Vulnerability to Climate Change and Prediction of Future Lake Habitat Distribution on the North Slope. Geophysical Institute, University of Alaska Fairbanks. Accessed August 12, 2011. Romanovskii, N.N., Hubberten, H.-W., Gavrilov, A.V., Tumskoy, V.E., Kholodov, A.L. (2004). Permafrost of the east Siberian Arctic shelf and coastal lowlands. Quaternary Science Reviews, 23(11–13), 1359–1369. Schuur, E., Vogel, J., Crummer, K., Lee, H., Sickman, J., and Osterkamp, T. (2009). The effect of permafrost thaw on old carbon release and net carbon exchange from tundra. Nature, 459 (7246), 556-559. Shakhova, N., Semiletov, I., Salyuk, A., Yusupov, V., Kosmach, D., Gustafsson, O., (2010). Extensive methane venting to the atmosphere from sediments of the East Siberian Arctic Shelf. Science, 327(5970), 1246–1250. Water and Environmental Research Center. Thermokarst Lakes. University of Alaska Fairbanks.